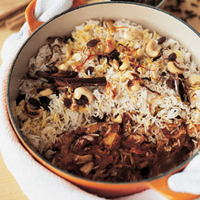 Forget turkey sandwiches, and make this lightly-spiced rice dish instead. The addition of fragrant rosewater makes this meal extra special. Heat 2 tbsp of the oil in a large flameproof casserole dish, add one third of the onions and fry for 3-4 minutes until they start to brown. Add the cashew nuts and fry for a further 2-3 minutes. Remove the onions and nuts with a slotted spoon, mix with the raisins and leave until required. Lower the heat, add a further 1 tbsp oil and cook the remaining onions with the curry paste in the pan, covered, for about 10 minutes, until the onions are very soft. Add the turkey and stir-fry for 2-3 minutes, then add the chopped tomatoes and simmer, covered, for 15 minutes. Wash the rice in a sieve until the water runs clear and drain thoroughly. Heat the remaining oil in a wide saucepan with a lid, add the spices, except for the saffron, and cook for a few seconds. Add the washed rice and stir-fry for 3-4 minutes. Add 600ml of boiling water, season, and return to the boil. Stir very briefly, then cover and simmer over a moderate heat for 10-12 minutes, until all the water is absorbed. Steep the saffron in the rose water with 1 tbsp hot water. Take the turkey off the heat and season, to taste. Scatter one third of the fried onion mixture over the turkey, then top with half the rice. Scatter half the remaining onions on top with half of the saffron and rose water. Repeat with the remaining rice, onions, saffron and rose water. Cover the pan with a tightly fitting lid and cook over a very gentle heat for 10 minutes. Alternatively, place in a hot oven at 200°C, gas mark 6 for 10 minutes. Serve with roughly chopped fresh coriander. Try a light, wheaty and refreshing beer, such as Fuller’s Discovery 500ml. Chill before serving.